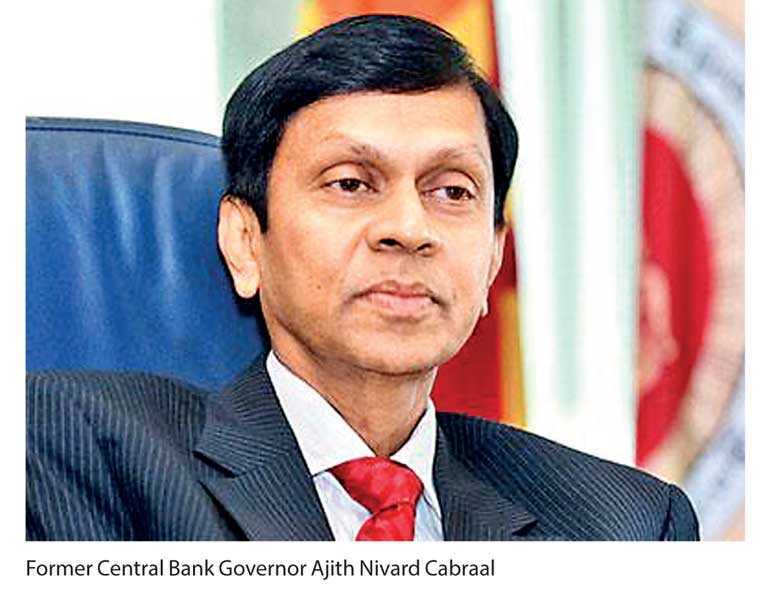 In my previous article on the above theme that appeared in Daily FT of 3 July (available at: http://www.ft.lk/columns/A-response-to-former-CB-Governor-Cabraal-s-article---The-Government-s-growth-scam-/4-658238), I proved beyond doubt that no ‘growth scam’ is evident as claimed by the former Governor of the Central Bank Ajith Nivard Cabraal (ANC) in his two articles which appeared in Daily FT of 26 June 2018 and 16 May 2017. This article will focus on his estimations of nominal Gross Domestic Product (GDP) for 2017, and the two indicators derived from it, i.e. GDP per capita in US dollar terms, and public debt/GDP ratio. In 2015, the Department of Census and Statistics rebased its GDP series from the base year 2002 to 2010 so as to widen the coverage of data collection and to adopt latest national accounting methodologies. This resulted in a variation of GDP figures from the previous series. In his two articles, ANC misinterpreted such revisions as data manipulations or ‘doctoring’ of data carried out by the ‘Growth Manipulating Team’ to gain political mileage. As I elaborated in my previous article, a closer look at the two data sets does not reveal any such manipulations. The writer confuses the reader by computing the growth rate by using two incomparable data series and various other statistical flaws. Based on his own computations, ANC argues that the nominal GDP value for 2017 has been substantially over-stated by a sum of Rs. 322 billion, when compared with the “pumped-up” nominal GDP value of Rs. 13,289 billion which was announced by the authorities. According to him, this overestimation occurred, because the national accounts compilers used an unrealistically higher GDP deflator for the year. For the purpose of computing his own GDP deflator for 2017, ANC uses an assumed relationship between the rates of change in Colombo Consumer Price Index (CCPI) and GDP Deflator for 2014. In that year, the CCPI inflation was 3.3% and the GDP Deflator inflation was 2.9%. 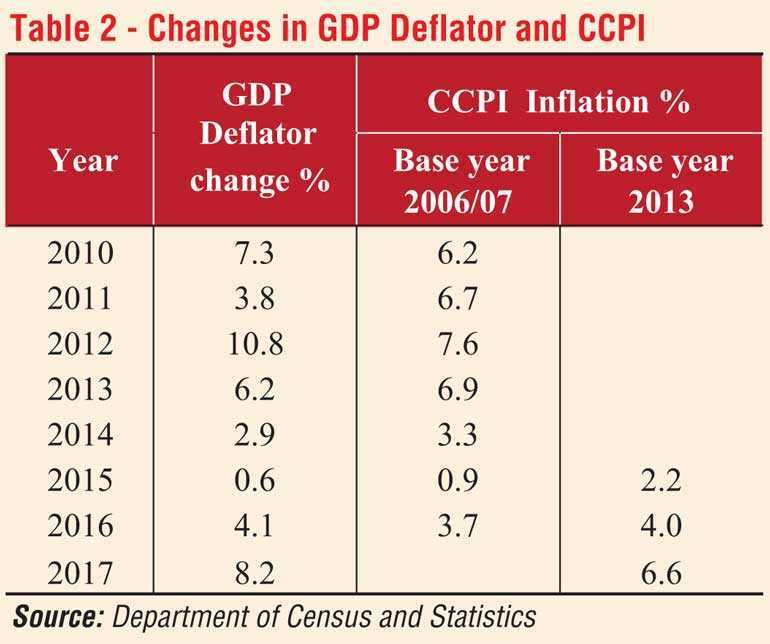 As the CCPI change in 2017 is 6.6%, which is double that of the CCPI change in 2014, ANC asserts by the same token, the GDP Deflator inflation in 2017 should have been 5.8% (=2.9% X 2). Accordingly, ANC argues that the Nominal GDP for 2017 should have been Rs. 12,967 billion (=Rs. 11,907 bn. X 1.089), instead of the published figure of Rs. 13,289 billion, announced by the authorities (table 1). This shows that the nominal GDP for 2017 is over-estimated by Rs. 322 billion, as noted earlier. The computation shown in the table is entirely wrong for two reasons. First, the CCPI figures that ANC uses are not comparable. The CCPI inflation of 3.3% for 2014 belongs to the base year series of 2006/07 whereas the inflation of 6.6% for 2017 belongs to the base year series of 2013 (Table 2). Second, it is statistically incorrect to use the CCPI to derive the GDP deflator, as these are two distinct indices based on totally different concepts and methodologies, as discussed below. The CCPI is used to measure the changes over time in the general level of retail prices of selected goods and services that households purchase for consumption. CCPI is computed as a weighted average of the percentage price changes for a specified set, or “basket”, of consumer products, the weights reflecting their relative importance in household consumption in a particular period. In re-estimating his nominal GDP figure for 2017, ANC does not adhere to any of those national accounting fundamentals, and as a result, his computations are found to be inaccurate. Based on his own estimates, ANC goes on to compute other indicators including per capita income in US dollar terms and public debt/ GDP ratio. The nominal GDP for 2017 at Rs. 12,967 billion is equivalent to $ 85 billion (at Rs. 152.40 per dollar), suggesting a per capita income of only $ 3,967, instead of the published figure of $ 4,065, ANC argues. Also, ANC uses his new nominal GDP number to work out the public debt ratio and argues that the Debt to GDP ratio would increase to 82.5% for 2017, in comparison with the Auditor General’s estimated ratio of 81.0% and the officially published ratio of 77.6%. ANC’s computation, however, loses its ground, as his nominal GDP figure is wrong, as I pointed out here and in the last week’s article. It may be noted that the official debt/GDP ratio, which is based on the 2010 GDP series, is 77.4% for 2017 (Table 3). In his recent article, ANC makes an outcry to international rating agencies to downgrade Sri Lanka’s credit ratings in view of the poor quality of GDP figures and other macroeconomic data, which are said to be manipulated by the authorities. He also appeals to foreign investors to reassess the country’s creditworthiness taking into account ‘data manipulations’ when making investment decisions pertaining to Sri Lanka. It is questionable how far such appeals made by Cabraal hold water in the light of numerous conceptual and statistical flaws in his write-ups, as I elaborated in this article and also in the previous one. Leaving aside the controversy over the growth numbers and the accompanying party politics, the fact remains that Sri Lanka is facing severe production constraints, as reflected in the downward sloping growth path in recent years. 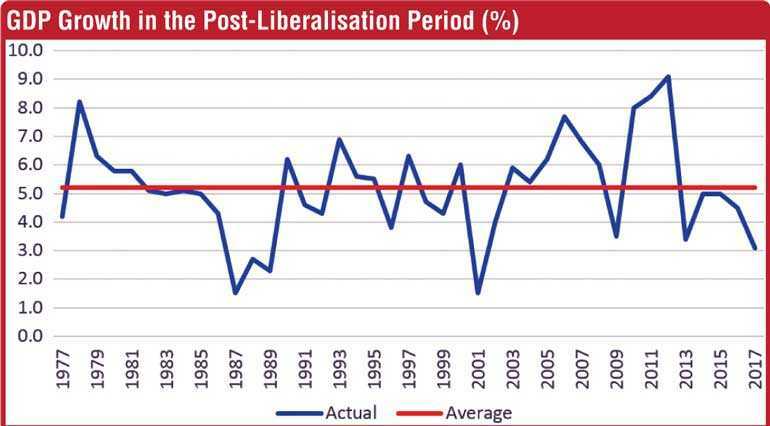 The economy experienced a modest average GDP growth rate of 5.2% with short-term fluctuations during the entire post-liberalisation period, 1977-2017, as shown in the chart. GDP growth exceeding 8% was achieved only in four years throughout this period. Such growth achieved during the three years from 2010 to 2012 is remarkable. The expansion of production activities and the government-led infrastructure development following the cessation of the war in 2009 boosted the economy during that period. However, the growth momentum experienced in the aftermath of the war was short-lived, and the economy reverted back to its usual growth path afterwards. The average GDP growth rate halved from 8.5% in 2010-2012 to 4.2% in 2013-2017 with the growth rate falling down to a 16-year low level of 3.1% in 2017. The downward growth path indicates that the country fails to break its production possibility limits due to over-dependence on factor-driven manufacturing products (mainly garments), construction, import trade and financial services. Such activities cannot sustain a high growth trajectory over a long period. Unless the Government, along with private sector participation, makes a breakthrough to shift the production structure to technology and innovation-based products, persistence of economic stagnation is unavoidable. These policy imperatives have been overlooked by the successive governments, as political compulsions tend to undermine economic priorities. Robust fiscal and monetary policies are essential to facilitate the growth process. Fiscal discipline deteriorated over a long period due to revenue setbacks, populist welfare handouts, increased public sector employment and loss-making State-Owned Enterprises. The attempts that are currently being undertaken to rectify some of these areas are not going to be easy due to political pressures. The rising debt commitments make fiscal consolidation extremely strenuous. 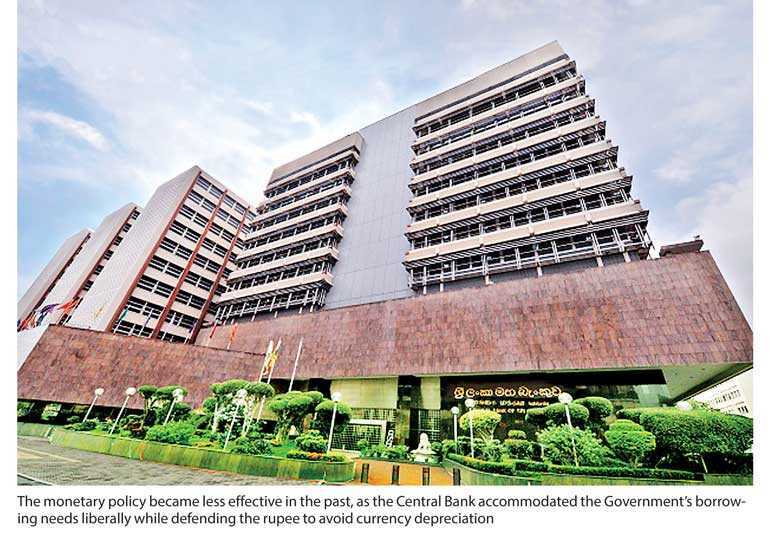 The monetary policy became less effective in the past, as the Central Bank accommodated the Government’s borrowing needs liberally while defending the rupee to avoid currency depreciation. Such policy stance led to boost market liquidity creating inflationary pressures, on the one hand, and to overvalue the rupee aggravating foreign exchange imbalances, on the other. The inflation targeting monetary policy framework recently launched by the Central Bank is expected to overcome such drawbacks by insisting on greater fiscal discipline and adopting a flexible exchange rate system.